Take the challenge to purge something from your closet, schedule, or cupboards and enjoy the freedom of simplifying! 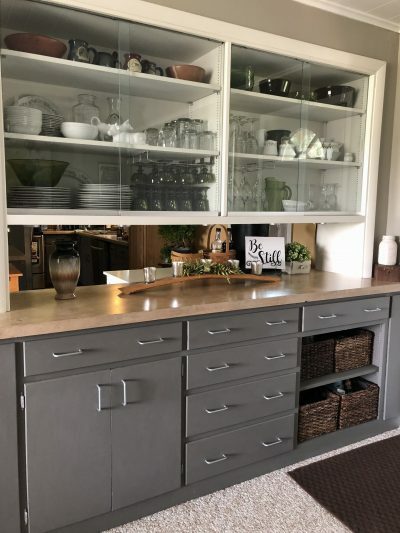 See how a little paint can transform a plywood built-in cabinet into something classy. And learn more about how a new book is helping people heal from grief. Whether your next project is simplifying and tossing, re-doing something that needs a makeover, or moving forward from grief, we'd love to hear your story! What do you have too much of? Do you open a storage closet, only to have to duck to avoid the avalanche of stuff? Are your cupboards too crammed for your dishes? Is your clothes closet bursting to the point of needing to un-wedge articles of clothing from between rows clothing hangers to wear something. Inevitably, this means it is wrinkled beyond slept-in-it quality. Does your schedule have too many appointments? Too much stress from overcommitment? Are you double-booked on most days? Perhaps you have too much food on your plate, which leads to too much padding on your bottom. I can relate to this one. Well, I can actually relate to all of them. 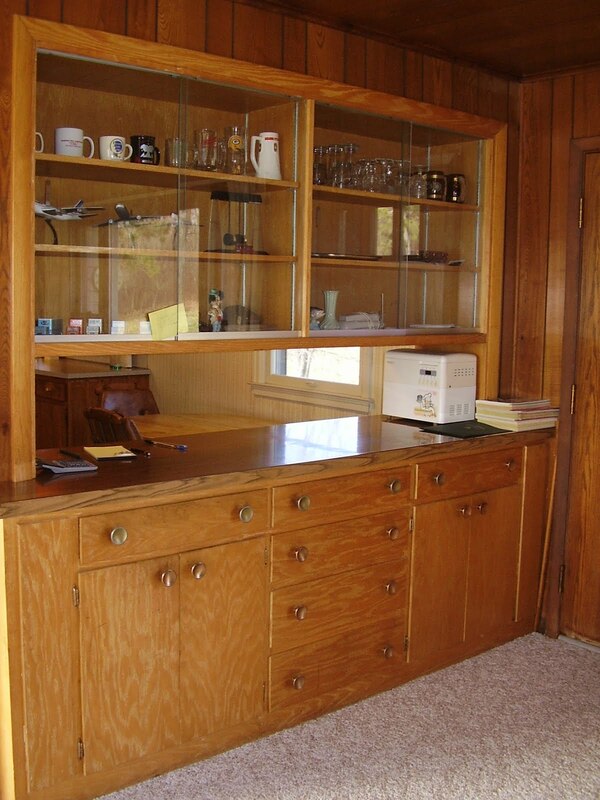 As I started the china hutch project in the section below, I needed to remove everything from the shelves. As I loaded it into the dishwasher in batches to clean off the layers of dust, I wondered, when was the last time I used this serving bowl? Have I ever used these teacups? I decided that a makeover of the cabinet was a perfect opportunity to purge excess from my cupboards. It felt great to box up some for the local charity and a few heirlooms for storage in the cabinet below. The extra space around the remaining items makes them all look like they can breathe now. Looking at it before was like standing before the doors of the light rail transit train at the airport when it opens and I'm wheeling two suitcases. Sometimes I have to wait for the next train if I don't want to stand with my nose in the armpit of another traveler. I know! Not a pretty picture at all. Where do you need margin most in your life? Where could a purge bring you peace and joy? If you take an action step, would you send me a message by email or social media to let me know how it went? I'd love to send you a digital high five! When we purchased our home in 2005, there were many parts of it that seemed as if 1975 had arrived and stayed for 30 years. 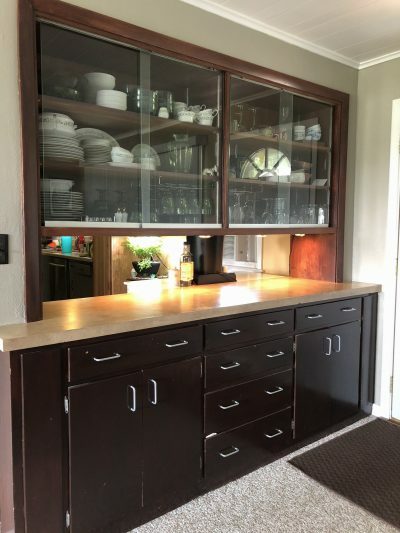 One was the built-in china hutch. I loved the space, but wasn't sure what to do with it. I did a faux finish on the laminate counter and the yellow oak. 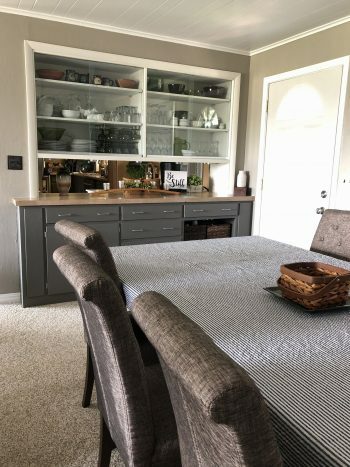 This is what it looked like when we purchased the home...complete with the display items of the bachelor brothers who owned the home when we bought it. Wow! That paneling is another story. See that first makeover here. This is the before and after from the first makeover. But now, even more time has passed, and it really needed one more update. This is what I did with it on round two! Well, it's really more of a 13-year work in progress with various updates of color, hardware and such. I used chalk paint that I made. Watch for the recipe in the next blog issue! 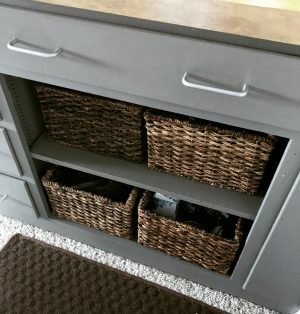 I decided to leave the doors off the one cabinet for now and have quick access to these attractive baskets from Target. I recently received this book from Mary Potter Kenyon and left reviews of it online. Mary's husband passed away just as she was launching a writing career, and she wrote prolifically during her time of grief. Now she has released a book that tells her story, but also leaves places for the reader to begin their own process of healing through journaling. The combination of Mary's story and the blank journal pages makes this a unique book. I've already passed my copy on to someone who I thought could use it. The writing prompts and helpful for getting started, and getting it all out on paper. Posted in Articles, Before and After, Books & Resources, Creative Ideas, Everyday Life & Practical Tips, Faux Finishes, Uncategorized.